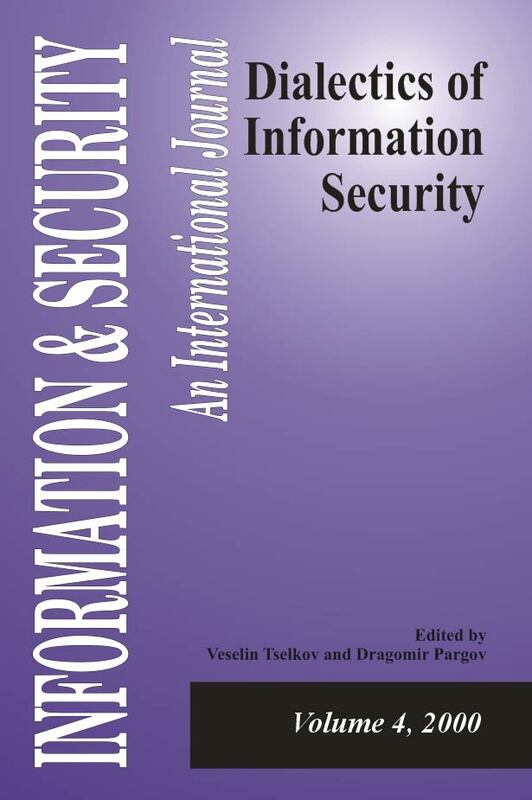 This volume examines the evolution of information security in the information age - when data traffic is tripling every year and will overtake voice as the dominant type of traffic over the worldwide telecommunication networks by 2005. The authors identify threats and vulnerabilities to the information society related to computer viruses and cellular communications, that are by nature constantly changing. A number of articles present solutions for better information protection, including cryptographic software and TEMPEST-type of solutions. Editorial. "Dialectics of Information Security." Information & Security: An International Journal 4 (2000): 2-12. Gotchev, Deyan. "Kaleidoscopic Approach to Security Shadows in the Age of Information." Information & Security: An International Journal 4 (2000): 13-32. Borden, Andrew. "The Dialectics of Information – A Framework." Information & Security: An International Journal 4 (2000): 33-40. Nickolov, Eugene. "Contemporary Trends in the Development of Information Security and Computer Virology." Information & Security: An International Journal 4 (2000): 60-72. Nachev, Atanas. "Electromagnetic Radiation and the Computer Systems Data Security Problem." Information & Security: An International Journal 4 (2000): 105-109. Monitor, ISIJ. "Information Warfare and Security." Information & Security: An International Journal 4 (2000): 113-115. Monitor, ISIJ. "Information Security Architecture: An Integrated Approach to Security in the Organization." Information & Security: An International Journal 4 (2000): 116. Monitor, ISIJ. "Information Security Management Handbook." Information & Security: An International Journal 4 (2000): 117-120. Monitor, ISIJ. "Network Security Fundamentals." Information & Security: An International Journal 4 (2000): 121-122. Monitor, ISIJ. "LAN Times Guide to Security and Data Integrity." Information & Security: An International Journal 4 (2000): 123-124. Monitor, ISIJ. "Network Intrusion Detection: An Analyst’s Handbook." Information & Security: An International Journal 4 (2000): 125-146.